In thought...: South Sudan Oyee Live! 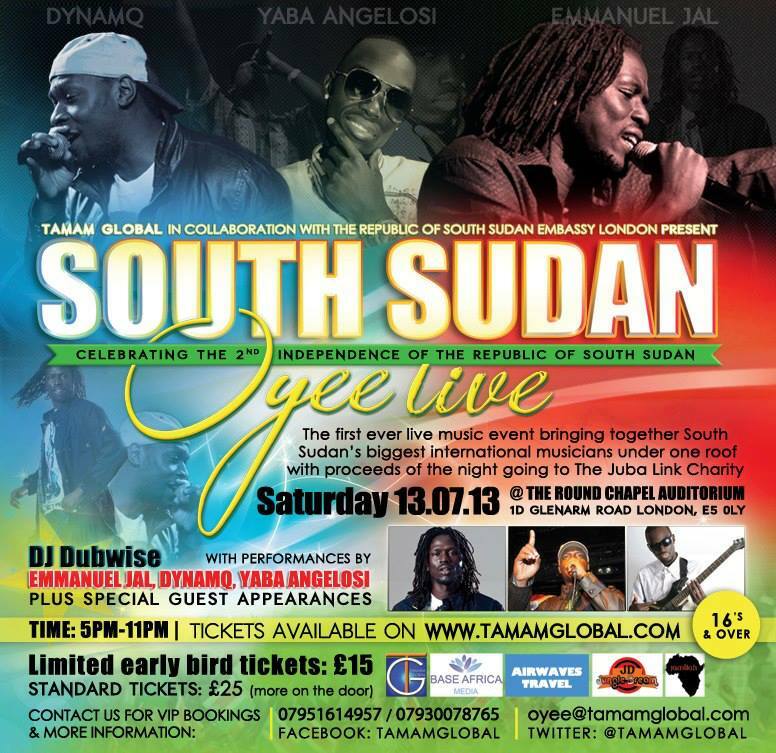 July 9th 2013 represents the 2nd anniversary of South Sudan's Independence. What a whirlwind two years it has been. There's a huge sense of national pride when I say 'I'm South Sudanese'... and that pride is definitely backed up by memories of our journey towards independence from Sudan. In celebration of the 2nd Independence anniversary, there's a great event (nothing like this has ever been done before) on Saturday the 13th of July. This event is especially unique because we will have three popular and talented South Sudanese artists performing for us in London. The event will also support THE JUBALINK charity. JUBALINK aims to improve healthcare services in South Sudan by training healthcare professionals and medical students. This is crucial because there is a lack of skilled healthcare staff in South Sudan. After a wonderful evening of performances, there will be an after party at Nile Bar and Restaurant, Turnpike Lane. The three artists who will be performing are Dynamq, Yaba Angelosi and Emmanuel Jal. Dynamq is an artist who loves reggae (having first performed at age 14 at the Bob Marley day Festival). Dynamq has performed alongside the legendary Wailer's Band (Bob Marley's Band), Wayne Wonder and more. Dynamq is also the creator of RUKA MUZIK (a new style of music which is currently taking East Africa by storm). Emmanuel Jal, also known as the 'Peace Soldier', offers a unique style of hip hop to the music world. Emmanuel is also a writer and a public speaker, speaking often about his experiences as a child soldier. His most recent album is Warchild (2008) and one of his live appearances includes performing live at the Nelson Mandela 90th Birthday Concert. Yaba Angelosi is a 6'2'' talented singer, lyricist, multiple instrument player and CEO of Assida Productions. His genre is Afro-Beat, Zouk, Soukous and R&B. He is passionate, prodigious (noted by the number of instruments he plays) and multifaceted. He has also worked with flavour. I Was A Victim Of The Happy Slap Craze. The Day Someone Said I Had Chicken Thighs. The Tipsy, The Drunk And The Sober. For You, Because I Care. Happy Independence Day South Sudan!